A well told story that leads from one unanswered question to the next. 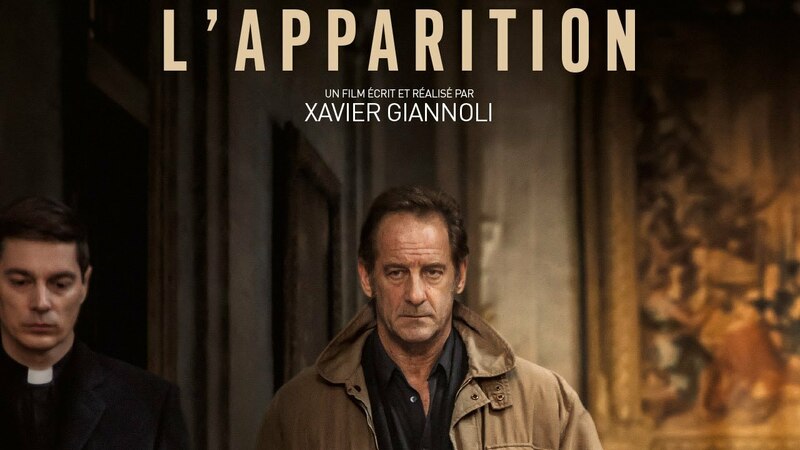 Written and directed by Xavier Giannoli, “The Apparition” (L’Apparition) follows war-weary journalist Jacques Mayano (Vincent Lindon), who has been hired by the Vatican to examine the credibility of an apparition of the Virgin Mary. Jacques is sent to a small village in France, where he finds a town overrun with religious pilgrims vying for an opportunity to see a devout young girl, Ann (Galatéa Bellugi), who is the one claiming to have seen the apparition. Before the Vatican calls Jacques, we find him hiding out at home with the windows covered in cardboard while his wife patiently deals with his Post Traumatic Stress. Even after he arrives in the little village, we still see the impact of the war as he suffers from a hearing problem. It is left unexplained, but we are lead to believe that it has to do with an explosive that went off, possibly the one that killed his friend. His ear hurts and rings. It is with all that baggage that he meets Ann. Ann for her part is a young girl living in a convent. She grew up as an orphan but chose to enter the church at an early age. She prays and quietly has faith that those around her have her best interests at heart. The priest at the church shields her as a father in both the religious and personal sense – but is that why he is doing it, or is there more to the story? L’Apparition has got to be one of the most well-cast films I’ve seen all year. Galatéa Bellugi is perfect as the innocent young girl who seems to believe what she is saying but is also hiding something. She has the perfect face and wide innocent eyes for someone we want to believe. And Vincent Lindon as a reporter who is recovering from a tragic loss of a friend and suffering from PTSD. He doesn’t need to say anything as we see every thought he has with his subtle performance. Is there a villain in this film? Not really, some people do bad things, even the protagonist who is so focused and driven by his work that he barely notices his wife. Each person Jacques encounters appears to have layers of truth and lies in everything they do. Ann has a secret life that no-one knows about, but is it the reason she might or might not be telling the truth about seeing The Virgin? Do the priests really have her best interest at heart, or are they using Ann? The movie is told in a series of chapters that lead you in one direction before the next chapter guides you in another. Is this a movie about PTSD, faith, money, mystery or all of that? “L’Apparition” is long at 2hrs 20mins and might feel long to a few people, especially those non-French speakers who aren’t into slow foreign films. As someone who is into movies that tell a well-crafted story I did not feel it was too long. With so many layers in this film we would lose too much if it were shorter, as each layer adds to the atmosphere of this film; from the massive spaces of the Vatican to the small rooms in the village houses. Some might argue that the ending is a bit of a let-down, but I don’t think it is. I think the ending works because this isn’t a movie about truth, it is a movie about faith. Not faith in a higher being, but faith in human beings and the nature of our souls to care about others.